Vps Solution is a European web hosting provider, providing you with reliable hosting services, VPS hosting, reseller hosting plans, shared hosting plans, and dedicated servers. Host your site with Vps Solution, and secure reliable hosting on the fastest and low ping servers in Europe. 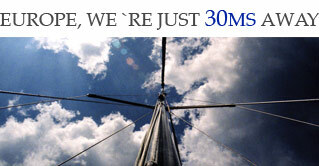 With typical pings of 30ms to most of Europe, we provide an excellent foundation for your business. Vps Solution owns the most reliable and powerful enterprise class hosting servers by IBM, Dell, and HP. We own and operate enterprise class Xeon MP servers. Our Datacenter's network is 100% Cisco powered, from the switch to the core routers. Our multi-homed European network offers 37Gbps total network capacity using 9 network carriers. Vps Solution is an SW-Soft Gold Partner, which allows us to provide our end users with the highest quality of support & response time. Web Hosting plans to fit every need, Linux or Windows servers available. Virtual Private Servers are available with all the major control panels, Plesk, HSPcomplete, cPanel, and DirectAdmin. Servers are also available without a control panel loaded, delivered with full root access. VPS hosting servers with root access, unlimited domains on Linux or Windows servers. With our Reseller hosting plans, you can resell our web hosting services under your own brand name.